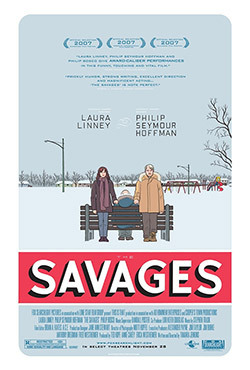 Jon and Wendy Savage are two siblings who have spent their adult years trying to recover from the abuse of their abusive father, Lenny Savage. Suddenly, a call comes in that his girlfriend has died, he cannot care for himself with his dementia and her family is dumping him on his children. Despite the fact Jon and Wendy have not spoken to Lenny for twenty years and he is even more loathsome than ever, the Savage siblings feel obliged to take care of him. Now together, brother and sister must come to terms with the new and painful responsibilities with their father now affecting their lives even as they struggle with their own personal demons Lenny helped create.